Search the Summit Greens Over 55's Active Adult Community in Clermont, Florida - Frontline Florida Realty Inc. 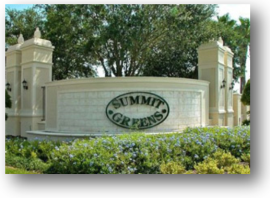 Summit Greens is an active adult gated community located in Clermont, Florida. This community offers homeowners an idyllic community setting, located in close proximity to all the shops, attractions and major highways. Summit Green is a smaller gated community with only 769 homes that offer activities, amenities and grounds that rival larger communities. Summit Greens 28,000 square-foot clubhouse offers homeowners a large, state-of-the art fitness center, aerobics studio, and heated indoor pool. The clubhouse also features a spacious media, computer, poker, and billiards rooms and a well-stocked library. Homeowners can enjoy casual dining at Summit Greens on-site restaurant, the Sanctuary Ridge. Summit Greens outdoor amenities include 8 flood lit tennis courts, softball fields, a heated outdoor pool, and the 18-hole Sanctuary Ridge golf course. Levitt & Sons began construction at Summit Greens in 2001, completing the community in 2006. All homes within the community are detached single-family style homes, all with well-designed floor plans, with most homes offering granite countertops, garages and hardwood floors. There are 12 home styles/models built within Summit Greens, with homes sizes ranging from 1,250 to 2,500 square feet. Homes were built with views in mind, with some homes overlooking scenic lakes and the golf course. All homes within Summit Greens feature tasteful manicured landscaping, which is maintained by the community and is included in the HOA fees. Summit Greens HOA fees are reasonable and includes the following: guard at the gatehouse, full-time activities director and maintenance of community grounds and all facilities. 2-3 bedroom, certain models allow for a den, 2 baths and attached 2 car garage. Square footage: 1,256 – 1,806 sq. ft.
Square footage: 1,879 – 2,179 sq. ft.
2-3 bedroom, certain models allow for a den, 2.5 baths and attached 2.5-3 car garage. Square footage: 2,238 – 2,467 sq. ft. Summit Greens is perfect for persons over 55 who are young at heart. Many residents within this community are still working! Whether you are an active retiree or employed, Summit Greens, Clermont FL, offers something for everyone. Socializing is the heart of this community! Summit Greens offers an abundance of clubs, groups and social events to residents. Clubs and groups include: card clubs, billiards, softball, opera club, book club, tennis club, dancing, performers club, Jewish club, Italian club and more! Monthly scheduled social events include: activities, dinners, and shows, which take place in the Summit Greens ballroom. Summit Greens offers residents the convenience of being ideally located to all you could need and want. The local college and regional library is located directly opposite the community. Shopping centers, restaurants, movie theaters/cinemas and gas stations can all be found within blocks of Summit Greens. Downtown Clermont is home to the renowned Lake Minneola and Clermont Public Beach, where you can enjoy boating, fishing, and camping. Summit Greens is also within each reach of The Mall at Millenia, Orlando International Airport and all the major attractions such as Disney World, Gatorland, Wonderworks, and Universal Studios Florida.